Winsor Pilates ball workouts allow anyone to benefit from Pilates. Pilates is a low-intensity stretching and sculpting exercise form created by Joseph Pilates in the early 20th century. However, it took almost a century to hit the mainstream, and much of the credit for that goes to Mari Winsor and her Winsor Pilates brand. 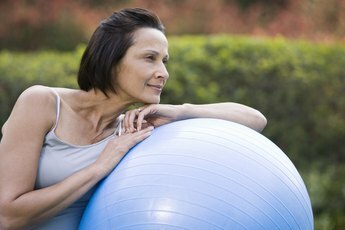 Using a basic stability ball, rather than expensive traditional equipment such as Reformers, allows almost anyone to reap the benefits of Pilates at home. German self-defense instructor Joseph Pilates created his exercise method to help bedridden patients boost their levels of health. In 1926 he immigrated to New York and opened a fitness studio. Mari Winsor is a dancer, teacher and author. When she opened her first Pilates-inspired studio in Los Angeles in 1990, she called her signature workout “dynamic sequencing.” Two years later she began studying under Pilates' successor and became certified as a true Pilates instructor. It was another 10 years before Winsor released her first infomercial, launching the Winsor Pilates craze. "Winsor Pilates Ball Workout" is a 2004 DVD. Pilates is meant to stretch and strengthen the muscles without damaging high-impact movements. Traditionally, it’s done either on a mat or using complicated equipment; Winsor was a pioneer at substituting a stability ball for some of that equipment. During the workout, you may be lying face up on the ball with your feet flat on the floor; lying face up on the floor with your feet on the ball; supporting yourself in a face-down position with your hands on the floor and your thighs or feet on the ball; or sitting on the ball. In general, Pilates moves done with the ball will focus on the core muscle groups, mainly working the abs and back. In addition, the quads, glutes, inner thighs, arms, upper back and shoulders may be engaged. Using a ball also improves balance. Unlike high-impact routines such as aerobics and other cardio exercises, the Pilates ball workout takes a gentle approach. It provides some of the strengthening benefits of weight lifting, but in a less intense way. Pilates is also a whole-body conditioning system, always engaging the core and improving flexibility, posture, concentration, breathing and balance, whereas working with weights typically targets one body part at a time. An additional benefit to using the ball is that you can do it at home, on your own time. Some people prefer working up a big sweat, which they get from higher-impact cardio workouts. Others have a goal to significantly improve strength, which is best done with weights. 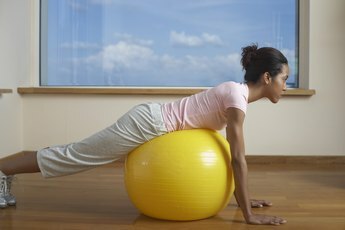 Also, the Pilates ball workout is not meant as a weight-loss regimen, although it’s possible to lose weight when combining Pilates with other healthy lifestyle changes. In fact, Pilates often works best when used in conjunction with other fitness routines such as yoga, weight lifting, martial arts or sports.